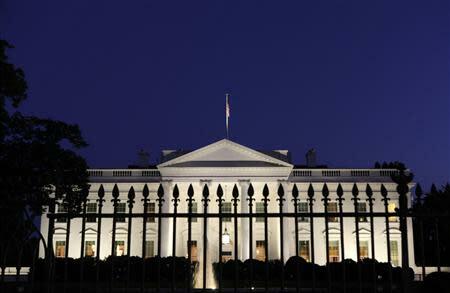 WASHINGTON (Reuters) - In the famous White House kitchen garden, tomatoes are rotting on the vine. Herbs have gone to seed. And the sweet potatoes - a favorite of President Barack Obama - have become worm food. It's another impact of the government shutdown, one that only the fox and the many squirrels that live on the White House grounds could love. A foodie blog called Obamafoodarama that obsessively covers the White House "food ephemera" and the administration's food policy has posted photos of the normally immaculate garden looking more like what most gardeners' plots appear at this time of the year - overgrown. "Due to the shutdown, garden maintenance has been reduced considerably and only being watered as needed," a White House official confirmed, speaking on background. First Lady Michelle Obama started the garden on the White House south lawn in 2009, the first time vegetables had been grown there since Eleanor Roosevelt's "victory garden" during World War Two. She uses the garden as a vehicle to talk about healthy eating and reducing childhood obesity. Some of the produce is used at the White House, while much is donated to a local soup kitchen. The foodie blog, run by editor Eddie Gehman Kohan, said White House gardeners are allowed only to water the plots and cannot harvest the vegetables. White House staff who normally volunteer to pick the weeds are off on furlough, Gehman Kohan said. "Pounds and pounds of ripe organic bounty have gone to waste," she wrote. "Weeds are springing up everywhere, and the vegetables that have already fallen off the vines are now mouldering on the ground," she said. She posted photos from cameras near the garden beds at http://obamafoodorama.blogspot.com, including one of a squirrel eating a cherry tomato. Squirrels are like "kids in a candy store, gorging themselves" on tomatoes and peppers, Gehman Kohan said.